The Washington area is thawing out from an ice storm last night! Icy conditions remain on some area roads, but most of the main roads are wet. Neighborhood roads are by far the most treacherous, and may not have been treated yet. Therefore, please continue to use caution when out and about today. Temperatures remain at or below freezing in some areas north and west of the I-95 corridor. A few snow showers and rain showers are possible tonight with lows in the lower 30s or possibly upper 20s in a few spots. There could be a few delays tomorrow morning but more than likely the story will be on-time school arrivals. The Capital Region Pulse has concluded live blogging for this event. We would like to thank all of our readers for checking in and using our website as your source. To see photos of the storm please scroll down to the previous postings below! Watch out for a possible snowy situation on Thursday night and Friday morning! We will have more on that as we draw closer to the event. The Capital Region is awakening to a decent glaze of ice that accumulated last night. The most significant icing is to the north and west of the I-95 corridor. Some areas picked up close to a third of an inch of ice accretion! Luckily, power outages have managed to stay in the low range and only a few hundred customers from each power company are reporting issues. Neighborhood roads remain extremely treacherous while main roads are improving or even simply wet in some areas due to heavy treatment. The full list of school closings can be found in the post below. Please note that some of the schools may be updating from "delayed" to "closed." Please double check all information with your school district's website. Although the precipitation is ending across the area, numerous icy roadways remain - especially in neighborhoods. Below, you will find a full list of closings and delays. Anne Arundel Co Schools - Closed Employees liberal leave. St. Mary's Co Schools - MD - Open 2 Hours Late Code 1. No AM K.
Manassas City Schools - VA - Closed. Code Gray. Also, the Federal Government will open two hours late with unscheduled leave. Please refer to the OPM website for more information on this. Even though the freezing rain has stopped in many areas, hazardous conditions remain widespread. Although main roads are generally being heavily salted and remain only somewhat icy, neighborhood streets are a different story. Also, a few power outages have been reported where the ice is heaviest. Roadways that are not heavily traveled are sheets of solid ice in parts of the area, mainly west of the Interstate 95 corridor. The Capital Region Pulse continues to track the winter storm that is currently impacting the Capital Region. Significant icing has already occurred in some areas along with sleet and snow accumulation as well. Roadways are extremely hazardous areawide with the worst conditions being west of I-95. Several schools have already posted delays or closings and those two school systems can be seen in the update below. They are Alexandria City Schools and Prince William County Schools. A neighborhood road in Montgomery Co, MD is solid ice. Stay tuned for continuing updates on this hazardous situation. Remember, only travel if absolutely necessary. The conditions will improve after sunrise but may remain hazardous north and west of the city. An icy commute is a near certainty. Many schools will likely delay or even close in some areas. A Winter Storm Warning continues for areas just north and west of Washington. 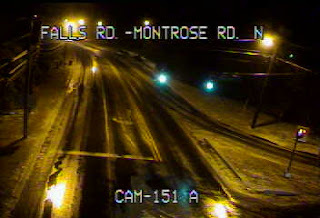 A wintry mess is developing on the roadways across the region. Earlier reports indicated that I-95 had been closed in the area of Triangle, VA. In addition, a few school closings and delays are already beginning to trickle into the newsroom here at The Capital Region Pulse HQ. Icing of over a quarter inch is possible in some areas mainly north and west of the I-95 corridor. Elsewhere, icing should remain below a quarter inch, but will still be enough to cause serious travel problems. Although salting crews are actively treating roadways, some roads continue to be hazardous. Prince William Co. School officials have just announced they will be closed tomorrow (11/18) due to the winter weather that is currently impacting the region. Stay tuned for continuing updates. Heavy sleet is falling in parts of the area right now. Areas farther to the south and east have changed over to freezing rain with a little sleet mixing in. There are still reports of mainly snow to the north and west. The Capital Region Pulse weather team is anticipating more and more schools to delay and close tomorrow or late tonight. Stay tuned to our website for the latest on these updates. We will also have a steady stream of pictures and updates on our site RIGHT HERE! Watch our Twitter, Facebook and website for the more up to date information. The Winter Weather Advisory for PARTS of the DC area has been UPGRADED to a Winter Storm Warning. The upgrade DOES NOT include DC proper but DOES include areas JUST to the north and west of the city. This includes Montgomery, Frederick, and other North Central Maryland counties. The National Weather Service now is forecasting two to three tenths of an inch of freezing rain (this is significant). Isolated power outages will become possible if the higher amounts are realized. Sleet and freezing rain will continue until a changeover in a few hours to all freezing rain. DO NOT travel unless required. Travel will become very hazardous as the night continues. Stay tuned to The Capital Region Pulse for updates on school closings and delays. The mixed bag of precipitation continues across the area. Lots of reports now coming in of dicey conditions on sidewalks and side streets. Montgomery Co. 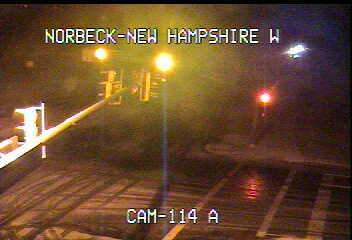 DOT seems to be on top of the situation at this hour with salt crews even treating some neighborhood roads. Snow and sleet fall in Montgomery Co, Maryland around 10:30pm on Monday night. A mixture of sleet, freezing rain, and snow is continuing in the DC Metro area. The Capital Region Pulse weather team expects this mixing to continue for the next hour or two before the predominate precipitation type becomes freezing rain (ice). No significant school closures have been reported yet, but stay tuned! 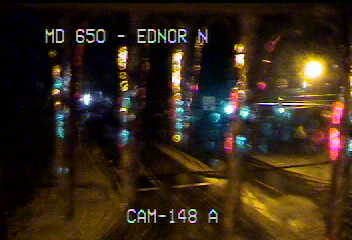 Lots of accidents and power outages being reported to the east of the metro area in Anne Arundel County. The National Weather Service has issued a Winter Weather Advisory for the entire DC Metro area. Freezing rain, sleet, and snow will impact the area this evening before changing over to all freezing rain later. Moderate amounts of ice are possible. Stay tuned for the latest information. You are free to share content as long as properly credited to "The Capital Region Pulse". Simple theme. Powered by Blogger.